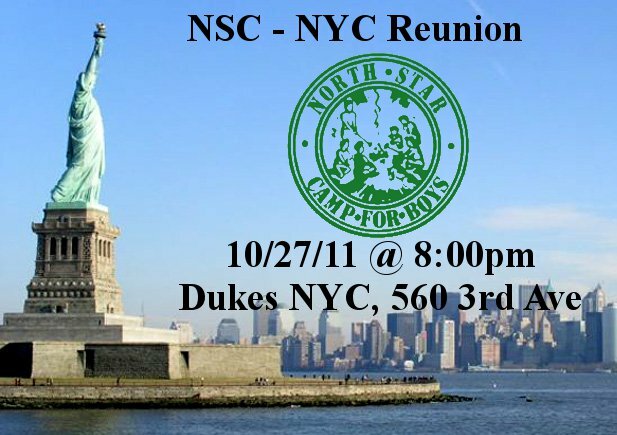 We hope that you can join us for appetizers and drinks at Dukes NYC as the North Star alumni in the New York area gather for a night of reminiscing about life in the Northwoods. Whether you come to catch up with old friends or network with other alumni in the area, we hope to see you there! Please spread the word to any other North Star alumni you may know in the area. And feel free to bring your friends or family. Please either RSVP on Facebook or send your reply to Andy@NorthStarCamp.com. And as always, please check in on the Alumni Website to make sure that your information is up to date. And if you know of anybody that might be interested in North Star, please fill out the Refer-A-Friend form. We're coming to your city! We've set dates and times for our several upcoming reunions. Each reunion is a great time to come and hang out with camp friends and check out "The Summer of 2011", the movie from this past summer. Julian Iannini is putting the finishing touches on the video and you won't want to miss it. Everyone will get a copy of the video as well as the 2012 NSC Calendar at the reunion and we'll send them out to those who are unable to attend. Keep an eye out for more reunion dates in Dallas, Los Angeles, Miami, Milwaukee, New York, Orlando Phoenix, San Diego, Tampa, and Washington D.C.
We wanted to let you know that the October Siren is now online. There you can read about what's been happening at camp since we left. Can you believe that was almost two months ago? We have had a beautiful fall up at camp and you can see some of the pictures on our Facebook page, which along with Twitter and our Leb's Ramblings Blog are always great sources of North Star news. Enrollment for next summer is off to an unbelievable start. We are full in some of our age groups for second session and nearly full in many others. If you have not yet registered for 2012, do not miss your chance. Register Now!If you know of anyone who may be interested in North Star for their son, please have them contact us and complete our short Refer-a-Friend form on the website. We hope you enjoy the October Siren. In it you will find out who is already signed up for next summer and information on our first round of camp reunions. We look forward to seeing you this Fall! Buried Treasure on the Athletic Fields? There have been many Cruiser Days over the years that have been built on the premise that there is buried treasure somewhere around camp. Typically the treasure turns out to be candy, and despite being buried for hundreds of years, it is still freshly sealed in a Walmart bag. So if we told you that we found some buried treasure in the middle of the athletic field, you would surely think we were pulling your leg. Right? We have some treasure hunters in the area who like to come to camp and either use metal detectors or go Scuba Diving around the shore to see if they can find any treasure. In the past, they have turned up coins and old artifacts, and even a wedding ring. They struck gold again, quite literally this time. Buried nearly a foot deep under the athletic field, they located a gold bracelet with the initials B.E.C. engraved on the front of the plate. On the back, the inscription reads "Love Now & Always, Gran & Gramps, 9/24/86." Now we need your help finding the owner of the bracelet. The treasure hunters are having the bracelet cleaned and polished, and they actually work with a TV show that documents cases like this where they are able to return lost items to their rightful owner. Please share this with all your fellow alumni so that we can find out who "B.E.C." might be and return the bracelet. And it may even end up on TV! As a former 10 Year Man at North Star Camp, I have learned the value of a camping experience in the North Woods. Today I am member of the Board of Directors of Camp Kesem, and I would like to ask your help to win $1 million to enable kids who are coping with their parent's cancer to attend special summer camps run by college kids for free! All you need to do is take one minute to vote by following the directions below and then passing this onto your kids, friends and business associates. Thank you so much for helping such a worthwhile cause! College students create Camp Kesem - a free camp for kids coping w/a parent’s cancer. About Camp Kesem. . .
For kids, Camp Kesem eases the fear and sadness of having a parent with cancer by providing FREE overnight summer camps where kids benefit from the healing comfort of peers facing similar challenges, gain confidence and the strength needed to deal with their parent's illness or death from cancer. Camp Kesem has the chance to receive $1 MILLION from Chase which will allow us to launch more camps and bring the healing benefits of Camp Kesem to more of the 1.5 million people affected by cancer each year. VOTE NOW for Camp Kesem - it only takes one minute. Starting today, Camp Kesem is competing for $1 MILLION in the Chase Community Giving online campaign. 2. “Allow access” to reach the voting platform. 3. VOTE for Camp Kesem - in the Champions of Health Category. We are confident that with the help of our wonderful Camp Kesem community – that means YOU – our university students, camper families, donors, alumni and volunteers - Camp Kesem can win Round One!! *Voting is on Facebook, if you do not have a Facebook page – please take one minute to set one up and VOTE for Camp Kesem. Please join us in this campaign: Only ONE vote per person, so it is critical that we rally as many votes as possible. Forward this to your address book - ask EVERYONE to VOTE for Camp Kesem! Thank you for being part of Camp Kesem!